Pelangi, a Malay word which means 'rainbow' is full of friendly charm and gentle hospitality, and is a place where the warmth of the sun and radiance of lush tropical gardens mingle with romantic nights. 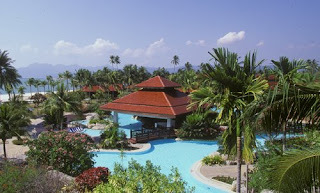 The relaxed and friendly atmosphere of the resort is synonymous with Langkawi's own laid back personality, making this a wholesome and splendid location for family holidays, honeymoons, golden citizens as well as seasoned business travellers. Set on 30 acres of of award-winning landscaped gardens beside white sandy beaches, this is the resort for a carefree getaway. The Meritus Pelangi Beach Resort & Spa, Langkawi is indeed an idyllic heaven of old charms located on one of the finest beaches in Langkawi. It is traditionally inspired and architecturally-designed like a Malaysian village or 'kampung'. The intricately-carved wooden chalets are built with timber that reflect a classical time. On the main island of Langkawi, Meritus Pelangi Beach Resort & Spa spreads over 30 acres of palm fringed beachfront facing Pulau Rebak Kecil.